A new range of mobile phones has just gone on sale in Ethiopia, with the onscreen menu in Amharic, and the ability to send SMS text messages in the Ge'ez script - used for Amharic and other languages in the region. 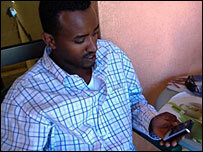 This is something of a breakthrough in a country where until recently text messaging was not allowed in any language. 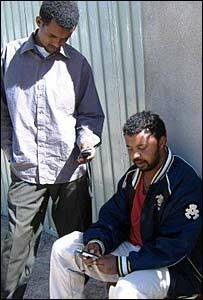 As the clock approached midnight on the Ethiopian New Year's Eve in September, just before the start of the year 2000 in the Ethiopian calendar, mobile phones across Addis Ababa started to bleep with the first text message their owners had received for two years. "I wish you Happy Ethiopian Millennium," it read in English. "SMS service will be launched shortly." And it was signed by the head of Ethiopian Telecom, the country's one and only telephone operator. This was as near as the company ever came to an acknowledgement that it had been blocking the service. Ethiopians had been able to send and receive messages in the past, but during the violent election protests in 2005 the service stopped working without explanation. Now text messaging is back. 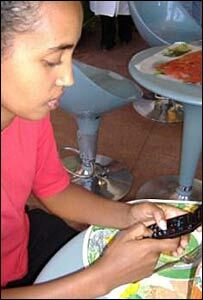 But although young Ethiopians are as devoted to their mobile phones as young people anywhere in the world, text messaging is not very popular. Until now the problem has been that mobile phones cannot cope with Amharic, which is written in the ancient Ge'ez script. Educated people text each other in English or Italian; if they want to send texts in their own language, Amharic speakers have to laboriously transliterate them into Roman script. 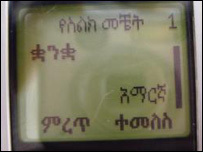 The new range of phones, developed by Nokia, have onscreen instructions in Amharic, keypads showing both Roman and Ge'ez characters, and even the ability to set the date according to Ethiopia's unique, 13-month calendar. The script will work for any language which uses the Ge'ez script - Amharic or Tigrinya in Ethiopia or the Tigre language spoken across the border in Eritrea. Developing a Ge'ez keyboard has been challenging. While the Roman alphabet has just 26 characters, Ge'ez characters, with all their variants, add up to nearly 300. Each one combines both a consonant and a vowel, meaning you need two keystrokes for each letter. So far the phones cannot do predictive messaging, but Nokia say they are working on it. The key to the system is the use of a Unicode - UCS2 standard - font. Any mobile network which is enabled for UCS2 should be able to transmit the Ge'ez characters, and any phone which is UCS2-capable should be able to display them successfully. In practice that suggests the networks which already transmit non-Roman scripts, like Hindi or Arabic, will probably be able to transmit Amharic as well. The phones are more problematical, but owners of recent-model handsets may find they can receive Amharic texts even if they do not themselves have a keypad which will send them. Nokia eventually plans to sell five different models, but it has started with a basic model, the Nokia 1200, priced at around $50 - the same as a similar model without the Amharic keypad. For smart young people around Addis Ababa, the plainness of this first model may be off-putting. Some I spoke to were excited by the idea of Amharic messaging, impressed by the affordable price, but disappointed when they discovered the phone model was neither slim-line nor did it have Bluetooth or a built-in camera. For the moment Ethiopia Telecom does have its Unicode capability switched on, although at the moment it is describing the Amharic capability as "a trial service" in 50 selected sites. If the new phones do catch on, they should be good business for Nokia. Their prediction for the next two years is that 80% of new mobile phone subscriptions will be in the developing world - something like one million new customers a day. With a relatively low mobile phone penetration so far, a population of more than 70 million people, and a large overseas diaspora, Ethiopia is seen as a big market opportunity.